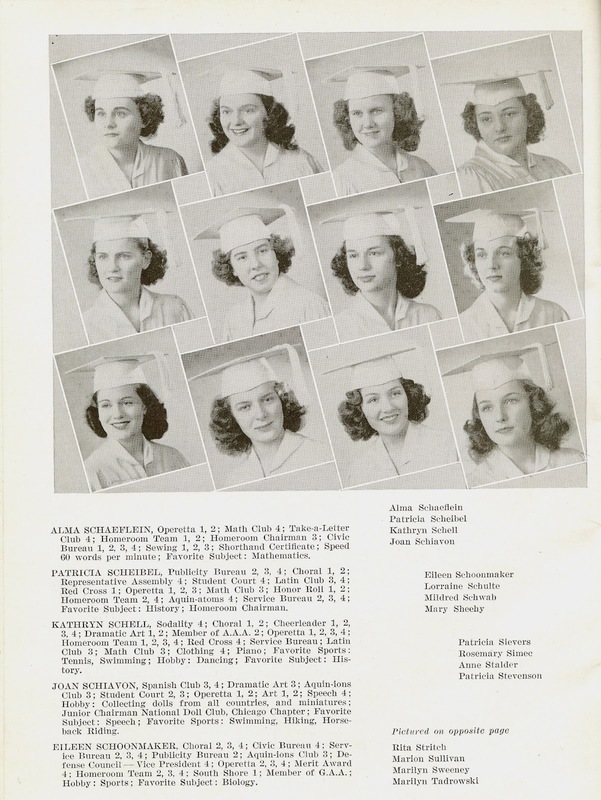 The 8th grade graduating class of Dixon Elementary School signed their names and declared their ambitions for adulthood in the centerfold pages of the June 1942 edition of the Dixon Beacon. My mother signed her name, Schiavon, Joan, in an elegant hand and declared she would become a designer. 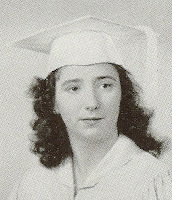 That fall, she entered Aquinas Dominican High School on the South Side of Chicago, where she would spend the next four years. 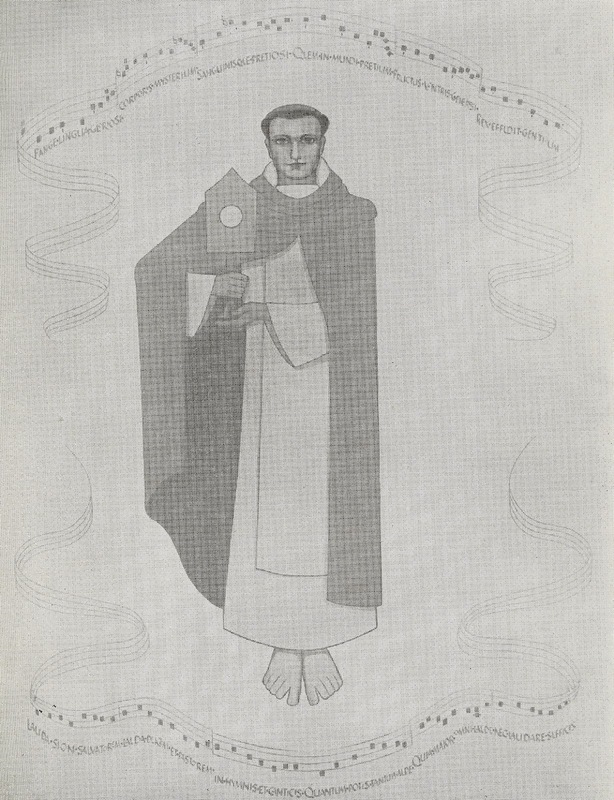 One of the first pages of Taquin, the 1946 school yearbook, mentions “the Aquinas Way of Life and Learning…’to praise, to teach and to bless.” During my mother’s time at the school, the students participated in a project to paint murals depicting the life of Saint Thomas Aquinas, for whom the school was named. 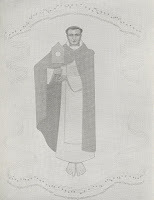 My mother took great pride in her part in the effort: her contribution was painting Thomas Aquinas’ feet on the main mural in the entry hall. 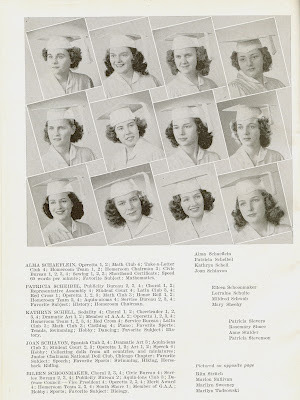 The Dominican sisters of Adrian, Michigan, ran the all-girl school and were strict with their teenage charges. When a student broke the rules, she might suffer a consequence such as having to scrub the linoleum floors with a toothbrush. My mother was an unlucky offender once and recalled being on her hands and knees for hours under the watchful eye of Sister Rose Francis, who made sure she did not “miss a spot” on the main floor – including the first flight of stairs. 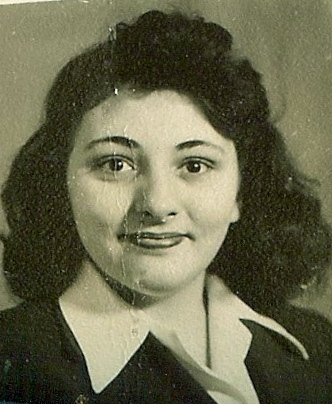 Whatever her transgression was, my mother made sure to never do it again. Sister Rose Francis was an English teacher, but my mother said she sometimes acted more like a drill sergeant. She would order her students to sit up straight in class, feet flat on the floor, as she paced up and down the aisles, checking their posture. “Uncross those limbs!” she would bark at those who dared to sit with their legs crossed. They would quickly oblige. Sister Rose Francis was as much a stickler for regulations as she was for modesty. If she suspected a uniform violation, she would call the girls up to the front of the classroom and have them kneel on the floor so she could check the length of their woolen uniform skirts. If a girl’s skirt did not touch the floor, she had to go to a corner of the room and cut a strip of cheesecloth and stitch it to her skirt hem, where it would stay until she could fix it at home. As everyone was still growing, most of the girls got to practice their sewing a lot during English class. Although most of the girls feared Sister Rose Francis, she was an excellent teacher, and those who made it through her class learned a deep appreciation for literature and found she also had gentle side. My mother also credited her with teaching her to write well. She spoke fondly of her and visited her for many years after her graduation. While at Aquinas, my mother became friends with Margaret Brehm. The two remained close into adult life, and “Aunt Marcy,” as we knew her, was a frequent visitor at our home in Chicago and even spent a couple of weeks with us after we moved to Mexico City. My mother loved her life at Aquinas. She was a good student who enjoyed English and history and excelled at speech and drama. 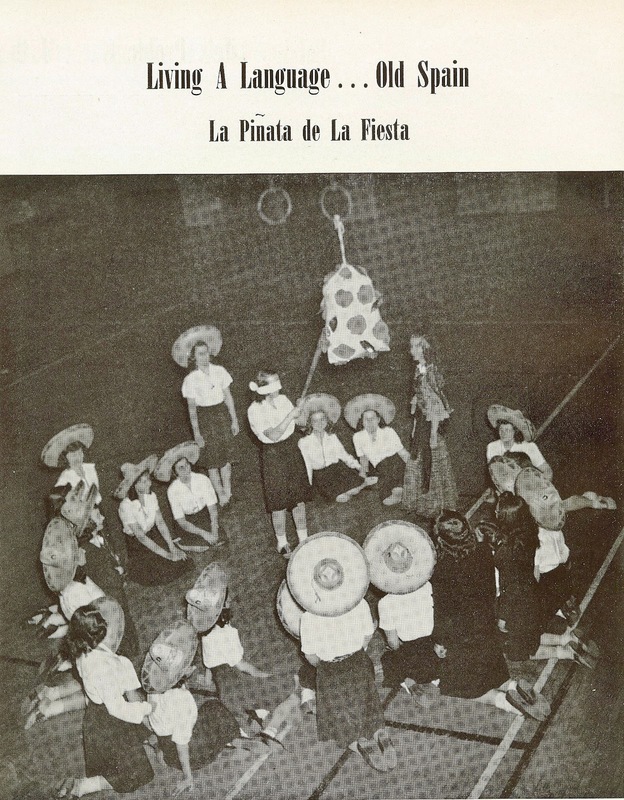 She found Spanish difficult and did not see much point in taking it, as she did not think she would ever use it. 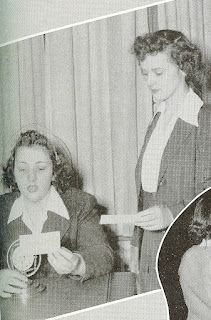 She was one of the fastest typists in her business class at 65 words per minute. It’s the school for every girl. With echoes of a love that will ne’er die. 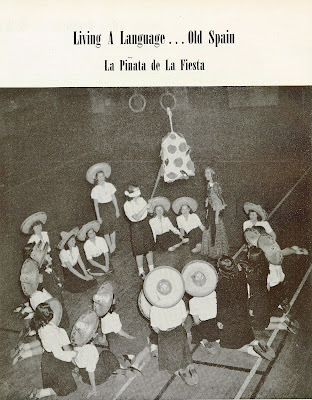 Her 1946 high school yearbook, Taquin, notes that she took part in Operetta, which appears to have been a musical/drama club. She probably was involved in drama, not music, as one of the nuns had told her she could not carry a tune. “Joan, don’t sing. Just move your lips, dear,” she whispered in my mother’s ear one afternoon in church during choir practice. My mother took that pretty hard and never sang in public again. She sang to my sisters and me, probably figuring that we were too young to care. She was right. We were her biggest fan club. What a neat story! I enjoyed reading about her experiences, thanks for sharing.